The fate of the free world is on the line in Tom Clancy's The Division® 2. UPlay and supportsWindows only. Tom Clancy’s The Division™ Trailer Video. Title: Tom Clancy’s The Division™. OS:Windows® 7, Windows 8.1, Windows 10 (64-bit versions only). Leading seemingly ordinary lives among us, these Agents are trained to operate independently in order to save society. Tom Clancy's The Division. Sleeper Agent Edition. Agent Armband. Season Pass Code. UPlay and supportsWindows only. This sale is for a genuine digital version of the DLCTom Clancy’s The Division™ - Survival. Tom Clancy’s The Division™ - Survival Trailer Video. Title: Tom Clancy’s The Division™ - Survival. Gold Edtion Steelbook. Tom Clancy's. Genre Action. The Division 2. Gold Edition Steelbook. Tom Clancy's. (Xbox One). Platform Xbox One. Genre Action. The Division 2. All disc are in good working condition, I polish any disc that I feels needs it with a professional machine. Disc Condition:Very Good. All tested and works well. I believe it is the quickest and safest option. LATAM Version. Tom Clancy's. Genre Shooter. The Division 2. Tom Clancy's. (PlayStation 4). The Division. Region information NTSC-US (Region-Free). 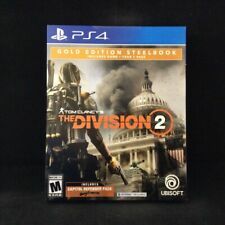 Tom Clancy's The Division 2 Gold Steelbook Edition PS4 with Free Shipping! Xbox One - Tom Clancy's The Division (EN/GER) (boxed) (used). Tom Clancy's The Division. Language is German. Pattern picture! Item may differ from the photo. Online code may no longer be usable. Mostly first edition (platinum or similar is possible). If your character is at a higher World Tier, your first crafted pestilence will be a higher level (GS 500 if within World Tier 5) so we suggest that your character is at World Tier 5 before acquiring your pestilence it will roll with higher stats than a lower gear score version. If your character is at a higher World Tier, your first crafted Chatterbox will be a higher level (GS 440 at World Tier 4 and GS 500 at World Tier 5) so we suggest that your character is at World Tier 4/5 before acquiring your Chatterbox as it will roll with higher stats than a lower gear score version. 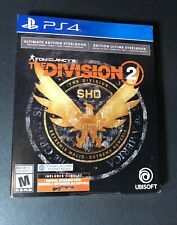 Tom Clancy's The Division 2 PS4. Condition is Brand New. Shipped with USPS First Class Package. You need Uplay to claim the key. Japan Usage Item. the manufacturer will change contents, date and quantity for sale. We do our best for you!! This edition does not include watch and season pass! Used PS4 Ubi the Best Division Japan Ver.